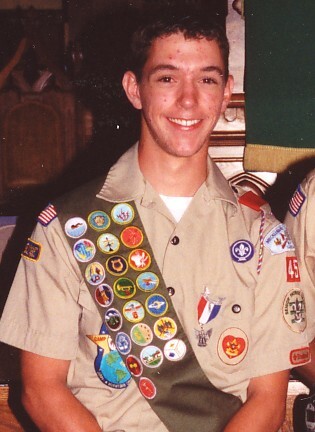 (August 2, 2005) Matthew David Martell is Troop 45's newest Eagle Scout. He was presented the Eagle Scout award at a special ceremony held in his honor on June 8, 2005. The Eagle award is the Boy Scout's highest honor awarded to a youth, and only about 4 percent of the boys who enter the Scouting program ever earn this award. As part of the Eagle Scout requirements, Matthew was required to complete a community service leadership project. For his project, Matthew designed and built an outdoor picnic area for Southwest Middle School. Matthew graduated this year from Olympic High School and plans to attend the University of North Carolina in the fall. Boy Scout Troop 45 is sponsored by Central Steele Creek Presbyterian Church, and is led by Lynn Snuggs. Central Steele Creek Presbyterian Church also sponsors Cub Scout Pack 45. Other area churches that sponsor Cub Scout Packs and Boy Scout Troops are Good Shepherd United Methodist Church (See Cub Scout Pack 167 Site), Pleasant Hill Presbyterian Church (See Boy Scout Troop 80 Site and Cub Scout Pack 80 Site), and Steele Creek Presbyterian Church. For more information on local Cub Scout Packs and Boy Scout Troops, contact these churches' offices or visit the web site for the Apache District of the Mecklenburg County Council.